Yamaha will team MotoGP, World Superbike, and All-Japan all-stars in hopes of repeating its 2015 Suzuka 8 Hours victory. Yamaha is ready to hunt for a second consecutive victory with two factory teams at the 39th "Coca-Cola Zero" Suzuka 8 Hours Endurance Road Race, to be held this week at the Suzuka Circuit in Mie Prefecture from July 28th to 31st. The Yamaha Factory Racing Team and the YART Yamaha Official EWC Team will use factory machines based on the YZF-R1 that have been specially developed by Yamaha Motor Co., Ltd. for endurance racing at Suzuka. Yamaha Motor Europe's supported GMT94 Yamaha Official EWC Team will also join the iconic event, seven weeks after their splendid win at the 12 Horas de Portimão race. The rider line-up for the Yamaha Factory Racing Team sees front man Katsuyuki Nakasuga return to the center stage together with Monster Yamaha Tech3's Pol Espargaró, who has become a good friend last year when they stormed to an impressive victory. The pair aim to defend their current grip on the Suzuka8H trophy together with Pata Yamaha Official WorldSBK Team's Alex Lowes, who - much like Espargaró - made his Endurance debut last year in Suzuka. The three Yamaha riders already gelled over the pre-race tests and secured the top position a fortnight ago thanks to the guidance from Team Manager Wataru Yoshikawa, the current manager of Yamaha's All Japan Road Race Championship factory team. YART Yamaha Official EWC Team has upgraded to a factory team status for the upcoming round. Led by Team Manager Mandy Kainz, first rider Broc Parkes will welcome Kouta Nozane (an EWC rookie) and Takuya Fujita, two young All Japan Championship's premier class riders, to the team. The trio hopes to gift Yamaha its sixth victory in the Suzuka 8 Hours' race history. The factory teams' challenges for the win are strengthened by having Monster Energy as their main sponsor this race weekend. GMT94 Yamaha Official EWC Team's David Checa, Niccolò Canepa and Lucas Mahias are also eager to take to the track after securing their first victory this year at the previous round in Portugal. With momentum on their side, they hope to better their fourth place of last year and stand on the podium for the first time since 2012. Iwata Racing Family team's Kazuyuki Nishimura, Genki Sawamura, and Takeshi Miyakoshi will represent Yamaha in the Superstock class. Their main goal in the race is employee growth, displaying the YZF-R1's true racing potential, and bettering last year's result of fifth in the Superstock class and thirty-ninth overall. Since its creation in 1962, the Suzuka Circuit has been a popular venue for motorcycle racing events and endurance is no exception. The first edition of the Suzuka 8 Hours race was contested in July 1978 and the circuit remains one of the few tracks to offer an eight-hour race over 5.821 km. The track is well known for its relentless speed and tricky direction changes, which is made an even bigger challenge by the extreme heat and humidity during the eight-hours of racing. This all adds to the electric atmosphere of the Suzuka8H event and with the Yamaha grand stand conveniently positioned right across the Yamaha pit box at the longest straight, fans can follow the race from start to finish, and see every pit stop in-between. "I think this year's combination will be perfect for Yamaha as the three riders come from the All Japan Championship, MotoGP and World Superbike, Yamaha's top categories. Looking back at last year where we had two MotoGP riders there was some rivalry. As a former rider I can understand that mentality so I think this year's combination is also great to fight for victory. I think all of our riders are capable of pole position so I am confident we can again have a strong race." "Last year was a really successful year for me, Yamaha came back as a Factory team and we won after 19 years of absence. There is some pressure to do it again but I'm confident as we have tested properly and the team is strong. We welcome Alex who was also very fast here last year in Suzuka, in the first stint he was top so I have confidence in our new teammate. If we do our best I believe we can win a second consecutive Suzuka victory." "Last year was my first experience at the Suzuka 8 Hours and I'm really happy to be here this time with the winning team! To be here with Yamaha is a great honor for me, I have a really strong set of teammates around me so I can't wait to get started this weekend and looking forward to doing the best I can." "It's always special to return to Japan for the Suzuka 8 Hours, and this year even more so as our first time as a Official Yamaha Factory Team. It's an exciting team for us with Broc as our experienced captain as a benchmark combined with two young Japanese riders keen to make their mark. We're looking forward as always to hitting the track and getting set up as quickly as possible for Sunday's race." "I'm happy to be here again for the fourth year with Yamaha. This is the first time I've ever had two Japanese teammates, the next generation of star riders form Japan so I'm looking forward to working with them. After testing we had good pace so I'm confident we'll hit the ground running ad give our best as always!" 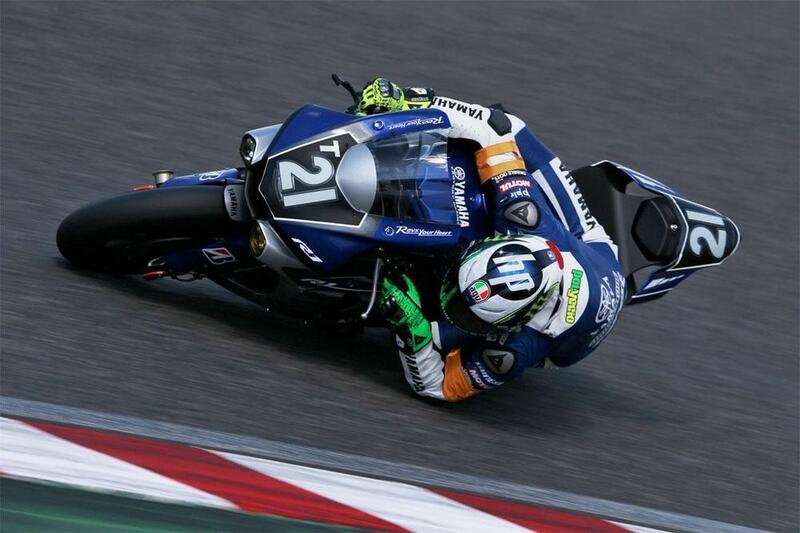 "This is my very first time in the Suzuka 8 Hours and my first time with a Factory team which makes me a bit nervous. I think this is a really good opportunity for me so I am determined to enjoy it and of course to do my best and give 100% to achieve the best result possible. "I'm in good condition and I'm ready for the weekend. I've taken part in the Suzuka 8 Hours three times but this is the first time to be supported at this level with a great bike and top team so I'm a little bit nervous. I'm enjoying the nerves in a positive way, the team communications is really good and with this team atmosphere for sure we can reach a good result, so my target is to finish within the top six." "We feel strong, our target is to be the first EWC team here to get enough points to fight for the title. After the Portimao victory it is not impossible to win. Our three riders are very fast, but Lucas still needs to learn the circuit! Yamaha has again welcomed us very warmly into Japan and have provided unbelievable support, it is a real pleasure and I think they are the only manufacturer that cares and supports their teams like this." "Tomorrow is the first free practice, we have plenty of things to test to adjust the bike and adapt to the new tires. Our target is to be world champion and stand on the podium. It will be challenging but the feeling is good, my teammates are good and the weather should be on our side!"